Honoring extraordinary women who are first in their fields. The Sackler Center First Awards is an annual event honoring extraordinary women who are first in their fields. Presented by Elizabeth Sackler and Gloria Steinem, the award is designed by Judy Chicago. Honorees have included Marin Alsop, Connie Chung, Johnnetta B. Cole, Anita F. Hill, Wilhelmina Cole Holladay, Sandy Lerner, Lucy R. Lippard, Chief Wilma Mankiller (posthumous), Toni Morrison, Linda Nochlin, Jessye Norman, Associate Justice Sandra Day O'Connor (Ret. ), Miss Piggy, Judith Rodin, Muriel Siebert, Susan Stroman, Julie Taymor, and Faye Wattleton. In celebration of art, feminisrm, and the tenth anniversary of the Elizabeth A. Sackler Center for Feminist Art, the 2017 Sackler Center First Awards honor eleven extraordinary women: Deborah Berke, Shirley Chisholm (posthumous), Jodi Archambault Gillette, Judith Jamison, Carol Jenkins, Roberta Kaplan, Kathy Kusner, Rita Moreno, Our Bodies Ourselves Ruth Simmons, and Edie Windsor (posthumous). Hosted by Laura Flanders. Awards presentation by Elizabeth Sackler and Gloria Steinem. 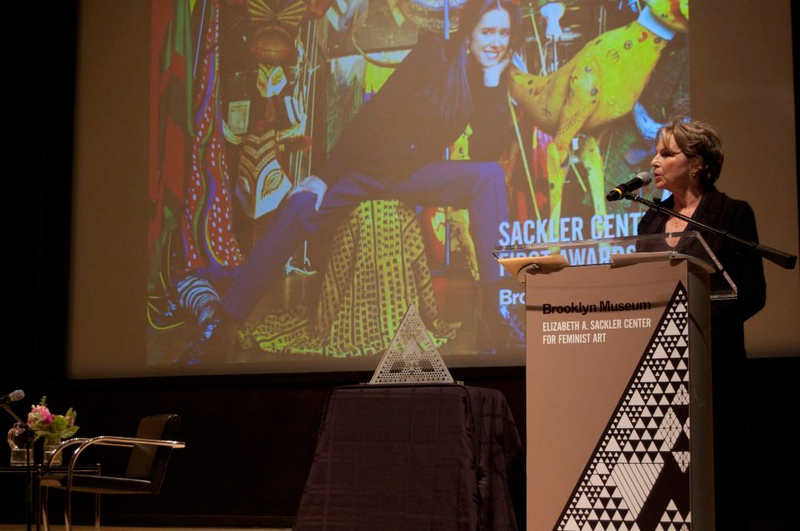 The 2017 Sackler Center First Awards took place as part of the 2017 Yes! Gala, which also honored Judy Chicago with the 2017 Women in the Arts Award. Presented by Elizabeth Sackler and Gloria Steinem, with special remarks by NYC First Lady Chirlane McCray, the 2016 Sackler Center First Awards honored Angela Y. Davis, Feminist Scholar Activist for Social Justice. Angela Y. Davis is an active student, teacher, writer, scholar, and activist/organizer. Her political activism began when she was a youngster in Birmingham, Alabama, and continued through her high school years in New York. But it was not until 1969 that she came to national attention after being removed from her teaching position in the Philosophy Department at UCLA as a result of her social activism and her membership in the Communist Party USA. In 1970, she was placed on the FBI’s Ten Most Wanted list on false charges, and was the subject of an intense police search that drove her underground and culminated in one of the most famous trials in recent U.S. history. During her sixteen-month incarceration, a massive international “Free Angela Davis” campaign was organized, leading to her acquittal in 1972. Through her activism and scholarship over many decades, Davis has been deeply involved in movements for social justice around the world. She is a vocal proponent of the twenty-first-century abolitionist movement, urging her audiences to think seriously about the possibility of a world without prisons. Her work as an educator has always emphasized the importance of building communities of struggle for economic, racial, and gender justice. Davis’s teaching career has taken her to San Francisco State University, Mills College, and U.C. Berkeley. She has also taught at UCLA, Vassar College, Syracuse University, the Claremont Colleges, and Stanford University. Most recently, she spent fifteen years at the University of California Santa Cruz, where she is now Distinguished Professor Emerita of History of Consciousness (an interdisciplinary Ph.D. program) and of Feminist Studies. She has also lectured throughout the United States as well as in Europe, Africa, Asia, Australia, and South America. Davis is the author of nine books, including Abolition Democracy: Beyond Prison, Torture and Empire and Are Prisons Obsolete?, about the abolition of the prison-industrial complex; a new edition of Narrative of the Life of Frederick Douglass; and a collection of essays titled The Meaning of Freedom. Her most recent book of essays, Freedom Is a Constant Struggle: Ferguson, Palestine, and the Foundations of a Movement, was published in February 2016. A founding member of Critical Resistance, a U.S. organization dedicated to the dismantling of the prison-industrial complex, she also works internationally with Sisters Inside, an abolitionist organization based in Queensland, Australia, that works in solidarity. Presented by Elizabeth Sackler and Gloria Steinem, the award is designed by Judy Chicago. The 2015 Sackler Center First Awards honored Miss Piggy -- icon, ultimate diva, and star of stage and screen who, for over forty years, has been blazing feminist trails with determination and humor, all while inspiring generations the world over. Special appearance by Kermit the Frog. Born and raised on a farm, Miss Piggy enjoyed a happy childhood—if hunkering down in mud is your idea of a good time. Before long, she was off to the big city to pursue her dream of fame, fortune, and, eventually, frogs. At first, Miss Piggy struggled with finding work, but she eventually landed a job as a hand model. From there, she entered the Miss Bogen County beauty contest, leading to a chance meeting with Kermit the Frog. The rest, as they say, is history . . . Soon after, Miss Piggy moved to London and got a job as part of the chorus in The Muppet Show. That lasted exactly one show. Halfway through her first musical number, she thrust herself into the spotlight, and never left. In an instant, she became a worldwide phenomenon within the entertainment industry. Over the years, Miss Piggy has captivated the world with hundreds of appearances on Good Morning America, America’s Got Talent, The Voice, Dancing with the Stars, The Tonight Show Starring Jimmy Fallon, and Saturday Night Live, among many others. Her divine visage has also been in countless magazines far too numerous to mention. Oh, alright— InStyle, People, Elle UK, TV Guide, and Time, to name just a few. Miss Piggy’s feature film credits include all eight Muppet movies: The Muppet Movie, The Great Muppet Caper, The Muppets Take Manhattan, The Muppet Christmas Carol, Muppet Treasure Island, Muppets from Space, The Muppets, and Muppets Most Wanted. Miss Piggy is also an established author, whose credits include In the Kitchen with Miss Piggy, Miss Piggy’s Rules, The Diva Code, and national best-seller Miss Piggy’s Guide to Life. All this, and Miss Piggy still has time to devote to her grand obsessions and two most important things in her life—her frog and her career (not necessarily in that order). Presented by Elizabeth Sackler and Gloria Steinem, with special remarks by NYC First Lady Chirlane McCray, the 2014 Sackler Center First Awards honored Anita F. Hill for Speaking Truth To Power. Anita F. Hill is Senior Advisor to the Provost, Professor of Law, Public Policy, and Women’s Studies, Heller Graduate School of Policy and Management, Brandeis University, Waltham, Massachusetts. Of Counsel at Cohen, Milstein, Sellers and Toll, Washington, D.C. The youngest of thirteen children of an Oklahoma farm family, Anita Hill received her J.D. from Yale Law School in 1980 and began her career in private practice in Washington, D.C., where she also worked at the U.S. Education Department and the Equal Employment Opportunity Commission. In 1989, Hill became the first African American to be tenured at the University of Oklahoma College of Law. Currently, at Brandeis University, she teaches courses on gender, race, social policy, and legal history. As counsel to Cohen Milstein, she advises on class action workplace discrimination cases. Hill’s latest book is Reimagining Equality: Stories of Gender, Race, and Finding Home (Beacon Press, 2011). Time, Newsweek, the New York Times, the Boston Globe, and Ms. magazine have all published Hill’s commentary, and she has made numerous appearances on national television. She is the recipient of many awards, grants, and honorary degrees. Hill’s professional and civic contributions include chairing the Human Rights Law Committee of the International Bar Association and membership on the Board of Governors of the Tufts Medical Center, the Board of Directors of the National Women’s Law Center, and the Boston Area Lawyers Committee for Civil Rights. Presented by Elizabeth Sackler and Gloria Steinem, the 2013 Sackler Center First Awards honored Julie Taymor, who became the first woman to win the Tony Award for Best Direction of a Musical, and won a Tony for Best Costumes, for her production of The Lion King (1998). Taymor's theater credits include Juan Darién: A Carnival Mass, A Midsummer Night’s Dream, The Green Bird,Titus Andronicus, The Tempest, The Taming of the Shrew, The Transposed Heads, and Liberty's Taken. Taymor's feature films include Titus; Frida, which earned six Academy Award nominations, winning two; the Beatles-inspired Across the Universe; and Shakespeare’s The Tempest. Taymor is a 1991 recipient of the MacArthur "genius" Fellowship. Presented by Elizabeth Sackler and Gloria Steinem, this inaugural Sackler Center First Awards program in 2012 honored fifteen remarkable women: Marin Alsop, Connie Chung, Johnnetta B. Cole, Wilhelmina Cole Holladay, Sandy Lerner, Lucy R. Lippard, Chief Wilma Mankiller (posthumous), Toni Morrison, Linda Nochlin, Jessye Norman, Associate Justice Sandra Day O'Connor (Ret. ), Judith Rodin, Muriel Siebert, Susan Stroman, and Faye Wattleton – with a special award presentation to Gloria Steinem.